As promised, the summary of the 2nd day. I must admit, it is a bit long but all these topics were fascinating and the speakers really stood out from the “crowd” with excellent ideas. If you do not wish to read it all, just have a look at the headlines by scrolling down and skip to the topic that catches your eye. With the current trends in demographic development,more than 2 million people in Switzerland will be over 65 in 2050. What does it mean? More surgery as ageing is very often the synonym of diseases. Surgery is more and more helped by technological tools, especially for complex cases like facial surgery where augmented reality could be really useful. But, technology has to be human centered and it is the moto of Mimedis, a fab lab for surgeons. Together with small interdisciplinary teams, the company focuses on design and manufacture (3D printing) of patient specific bone implants. The speaker is not only the founder of Mimedis but also the initiator of MedTech Innovation Partners (MTIP), which helps finance innovative medical technologies. MTIP has a clear focus on innovations within health technologies. It offers business building support as well as continuity of funding and its network to accelerate growth. Nothing has changed fundamentally on how things are cut in surgery. But laser could be extremely helpful, leading to finer and more precise cuts. Plates will need to be smaller and even resorbable. This technology also makes it be possible to perform functional cuts in order to avoid pain for the patient. It is a complete new thinking about how surgery is executed. No more straight cuts for an improved healing. Together with enabling technologies, such as navigation and robots holding laser, surgery will be much more efficient with reduced doses of anesthesia and better recovery time. The surgeon will not be replaced but empowered and the robot will be part of the surgery team. AOT is dedicated to the development, manufacturing and sales of medical devices for osteotomy pursuing the vision of contact-free bone surgery using laser, robotics and navigation systems to re-invent bone surgery (osteotomy). 3 lasers are built into the system; one of them is a ruler and will measure across the cut. The main product, Carlo, is a robot, currently tested in animal experiments. Innovation strategy coupled with human-centered design will deliver corporate value. Human-centered design is the primary goal of Erdmann Design. For human-centered design to produce worthwile results, several and diverse stakeholders are requested to interact and think on how can you help with low tech simple solutions. Stand where problems occurred helps understand better the real context and will generate more relevant solutions. It is not big data anymore but it is a tsunami of data. Not only text data but pictures, videos, sensor data… and 90% of the data was created in the last 2 years. How can we use it? What’s in there? Exogenous factors represent 60%. What do we mean when we say exogenous factors? It’s the information about lifestyle (diet, sport, smoking,…), behaviors, drug adherence. It is immensely useful when combined with all the other types of information. Humans are the best machine ever because of feelings such as compassion, intuition, design, value, judgement and common sense. No robot or machine is ever capable of such skills. However, machines have huge learning capabilities, especially deep learning (+ machine learning), discovery, large-scale math and fact checking. The last competency is crucial because, as of today, we do not know exactly what’s true on the internet. Watson will help reduce the time of drug discovery by identifying markers quicker and accelerate the time to market for drug projects. Welcome to the cognitive era! Talking with patient was key before, science has now made huge progress. From “medicine is art” to “medicine is a science”. As a result, medicine today is taking the human touch away. For a patient, talking and having explanations about the results of an exam is as important as undergoing an exam. Technology is here to increase the productivity of tasks but the relationship between the doctor and his patient has to stay and to be developed further. The human part of the process is already key in the healing process. Technology can connect people. Today, technology allows patients to find information and to empower them. Participation in decision-making about treatment options and pathways is relevant for patients. Moreover, smartphone and connected objects can help track patient symptoms and treatment choices. It is used today for Type 1 Diabetes glucose monitoring. With connected objects it is easier to monitor body parameters. Furthermore, doctors will be informed of those parameters and will be able to act upon. The patient has to be at the center of care, beyond simply being part of the loop. New types of expertise will show up, like medical data scientist, care coordinator, prevention doctor, education nurse,… and whole teams will collaborate in order to take care of the patient for better outcomes. Yesterday, the patient-doctor relationship was compassionate, coordinated, comprehensive, continuous, accessible and family-centered. Today, the change is not only technological but also societal. Patient-centered care is paradigm change, in which patients would like to be considered a they are and not as animals. A whole new ecosystem is emerging and developing itself. Between a patient and his/her doctor, very often, there is a nurse. Thus, it is more a patient-nurse system or relationship. But who is the expert? It is crucial to visit the right expert that will be able to pose the right diagnostic. Provider empowerment (or nurse empowerment in this case) via technology will free time for the doctor while the nurse will do the consultation and collect the data to send them to the doctor. He will then be able to analyze them and act upon. An interesting example comes from the dietitians of Canada, following obese patients and being their point of contact or new reference to talk to instead of the doctor. Technology allows patients to stay connected with healthcare professionals following them. In addition, digital technology makes it possible for healthcare professional to be empowered. Furthermore, caregivers and relatives can use digital technology as well. For example, Alertwatch is a tool giving relatives access to the localization of the loved one on a GPS map. Needless to say that caregivers will have more serenity, increased freedom themselves and improved information on the patient. Remote support is complementary to human support without replacing it. The human metabolism will slowly start to malfunction when we age. This will lead to damage and initiate some age-related pathologies. 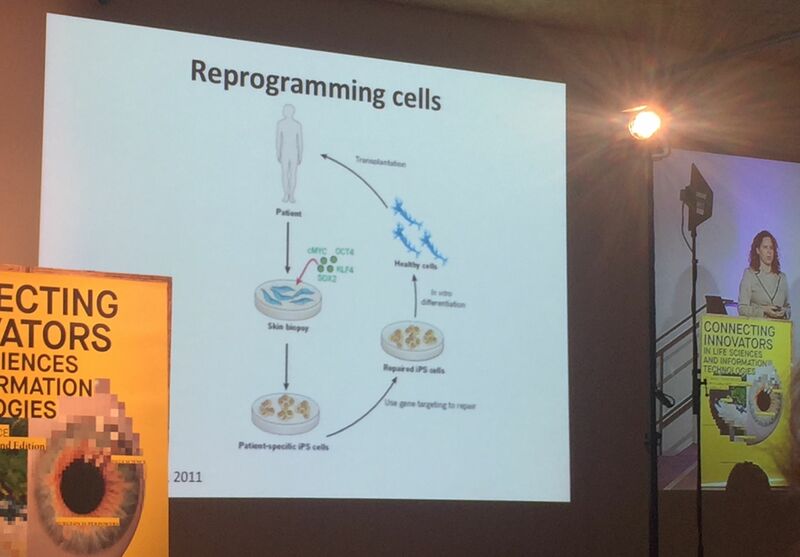 The speaker shows us how she works on reprogramming cells. 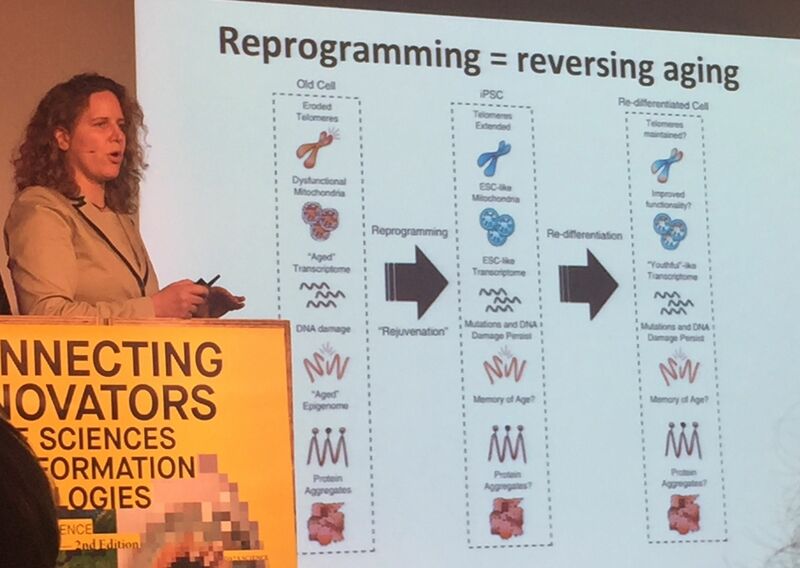 Reprogramming is not only reversing aging. It will reboot the cell and it will restart as a fresh cell. Reprogramming in vivo is the next step. For example in order to repair an infarcted heart. The speaker is the CEO of RetroBrain R&D and trying new approaches promoting people to live healthier. As we all know, it is difficult to incentivize now for long term benefits. The key to have a switch into the behaviors, it to change the way it is percieved: you change your behavior because it is cool and not for long term benefits. Gamification and videogaming are fundamentally different from the actions you could perform right know. You do not even realize you are changing your own behavior. How to motivate people? The game is challenging you again and again and when people succeed, they have a dopamine surge. These games influence will stimulate the brain and could delay dementia because of movements, social dimension and brain activity. The game can be personalized with car shapes and music appreciated by the patient. We should have fun when we are ageing. Interview in German and RetroBrain demo. The speaker is the founder of Changeist. For him, it is fundamental to look at the macro picture when it comes to ageing. He took the interesting example of Paro, a companion cuddle robot. It is a seal puppet therapeutic robot. It has been tested is geriatric facilities to help patients cope with multiple diseases such as dementia. The demographic time bomb challenge is fairly widespread. Senior Quantified-Self. These technologies will probably transform the way many families care for their loved ones. Estimated market size USD 14.6 bn in 2019. California Life Company – Calico. It will help bring new technologies to the market and promote their adoption for a better management of ageing. Intervention is easy to develop but the scale up is very difficult mainly for economic reasons. Human genome: why sharing is crucial? We are limited to reading the human genome and making sense of some of the parts today. 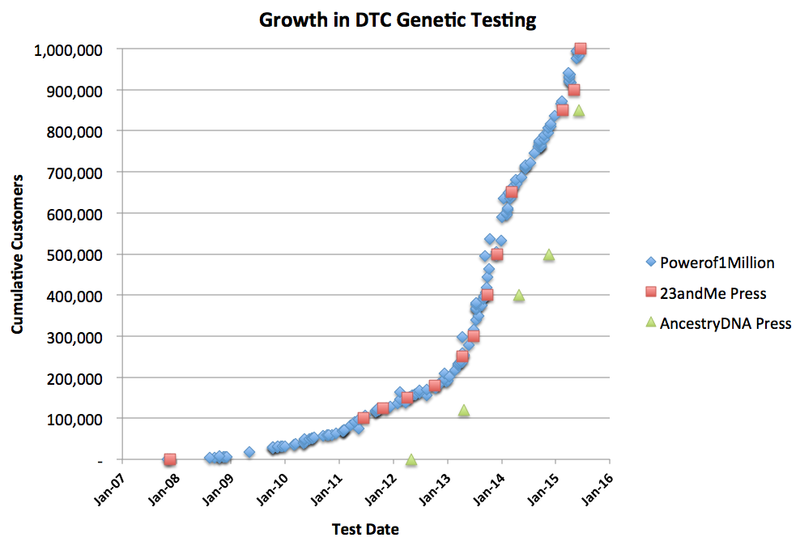 Genetic testing goes mainstream. Genotyping is the process of determining which genetic variants an individual possesses. Genotyping can be performed through a variety of different methods, depending on the variants of interest and resources available. For looking at many different variants at once, especially common variants, genotyping chips or arrays are an efficient and accurate option. These do, however, require prior knowledge of the variants you want to analyze. Sequencing is a method used to determine the exact sequence of a certain length of DNA. You can sequence a short piece, the whole genome, or parts of the genome (such as the “exome,” which are the parts of the genome that contain genes). Depending on the location, a given stretch may include some DNA that varies between individuals, like SNPs, in addition to regions that are constant. Thus, sequencing can be used to genotype someone for known variants, as well as identify variants that may be unique to that person. With genotyping, we look at SNP. We can then make some predictions with those data. For example: to see whether I will pass some of these genetic characteristics to my children. It is also widely used for ancestry analysis and microbiome exploration. Why should this data be open? Snpedia is sharing genomic data and helps determine whether you have higher risk. Connecting data to others can save lives. Big data is needed in this field. Dna digest is promoting data sharing because of limited publicly available data despite huge sequenced DNA. Malaria takes it toll on children as 86% of deaths are noted below age 5. Despite the 47% reduction in death since 2000 thank to an UN initiative focused on trying and improving public health in developing countries, the world still needs medicines to tackle the disease. The traditional model of drug development in silos, obsessed by profitability and shareholders value is not working for developing countries. A reassessment on how we do drug discovery in this field is necessary. A new model with a public health focus should be developed, like product development partnership. Interesting projcts are selected and funded. Advisors work in close collaboration with partners and open source science experienced. 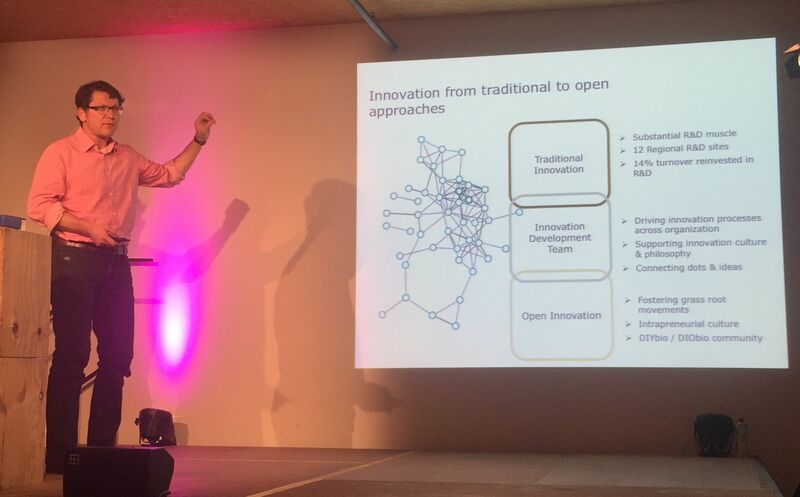 Open innovation is the standard model of MMV. How do they fund their late stage development candidate? They try to find a willing pharma partner or secure sufficient public funding. Open Access initiative: empowering research. 20’000 drug discovery starting points have been published, MMV selected 400. They are all commercially available. Another initiative has been launched in order to enrich the drug discovery database: the Malaria Box. Launched in 2011, it has already been supplied to 30 countries for a total of 218 boxes. A new project: the Pathogen Box, same initiative for neglected diseases to stimulate further research. 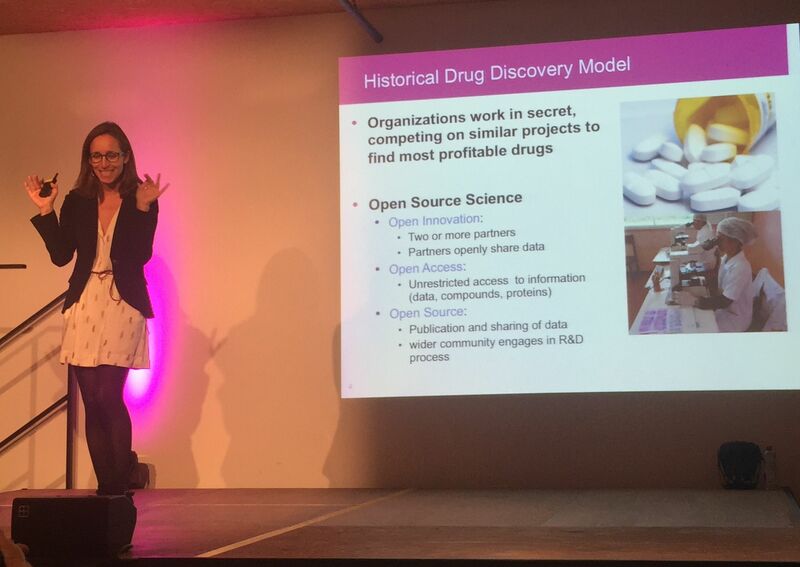 There is an ever increasing role of open source in new drug discovery models. The speaker sees brand new opportunities for collaborative innovation. How we manage, develop and initiate innovation will shift from traditional to open approaches. When you create into a community you not only achieve, you exceed what you achieve. Hackers want to change something and add a new innovation to existing products. The epicenter is both in US and Europe. 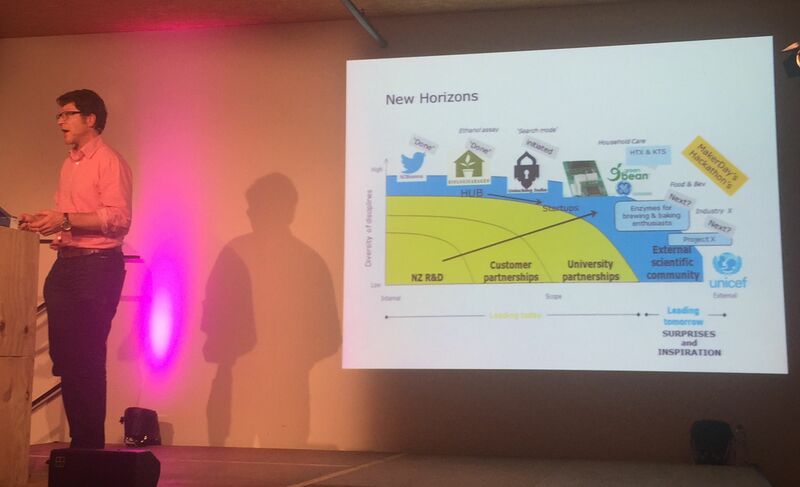 Novozymes started recently to collaborate with hackers in an open mode. Biologigaragen is an open space for citizen science in biology. In addition, tools are getting cheaper, easier to use and more powerful. Open trons is a USD 3000 full lab available to everyone. Transcriptic is a a fully automated cell and molecular biology laboratory in the cloud. Arcturus BioCloud is a way of sharing biotech experiments. SYNENERGENE is a four-years mobilization and mutual learning action plan (MMLAP) supported by the European Commission under the 7th Framework Programme. Joint value capture is fully present when engaging in open innovation. 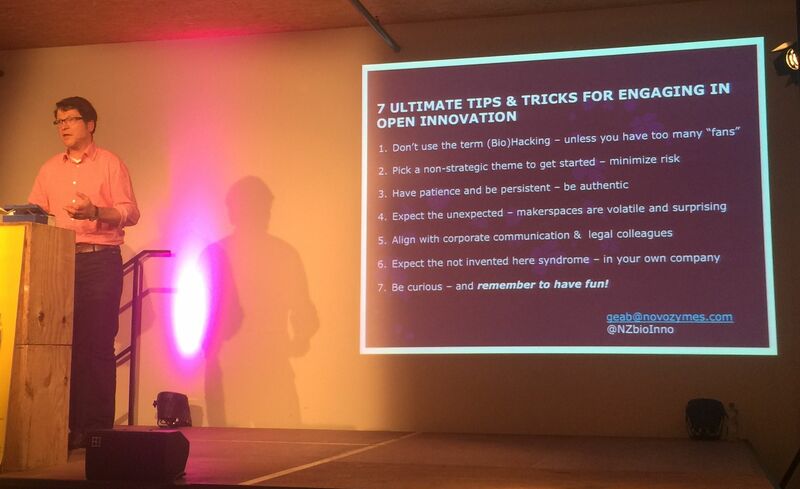 Last but not least – a fantastic lesson on how to engage in open innovation. 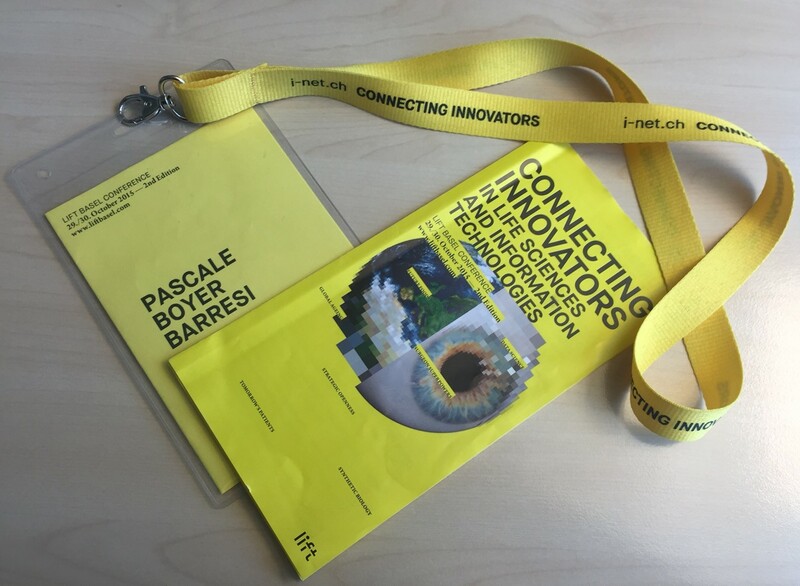 This entry was posted in Digital Health, Insightful, Mental Health, Metabolism, Trend Box, Video and tagged Ageing, Business models, Gamification, Human-centered design, Integrated care, Laser, Open Innovation, Outcome-based healthcare, Patient-doctor relationship, Surgery. Bookmark the permalink.